My husband and I were unable to go back to Alabama to be with our families for Thanksgiving. It was a pretty big bummer to not spend the holiday with my family for the first time in my twenty-six years, but Matt is my family now, too. And though we missed everyone back home, we didn't let the fact that it was just the two of us here stop us from preparing an enormous, traditional feast. I had to work on Thanksgiving Day, but I was off the day before, November 25. Matt rearranged his work schedule to give us that day off together. Anticipating that our festive dinner would knock out a large chunk of November's grocery cash (especially since Matt reaaaally wanted a ham), we were extra cautious with our budget during the first part of the month. We had a lot of burrito bowls (which is really just a more appealing way to say beans and rice). After all that scrimping and saving, we couldn't wait to gorge like fatties. 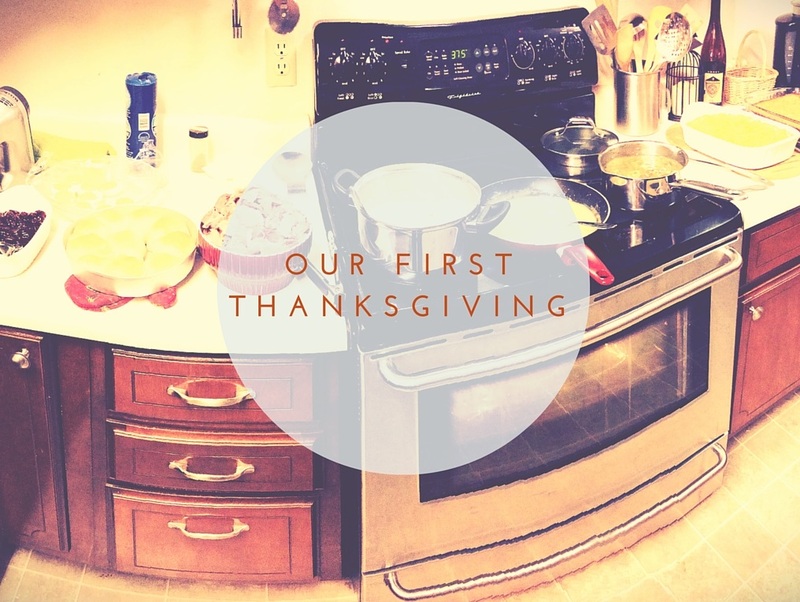 We began preparing the meal on the 24th, when I got home from work. I made a platter of deviled eggs and a skillet of homemade cornbread for my first solo attempt at my mom's amazing Southern cornbread dressing. The next day, we got up at our work-day-early time, had a light breakfast of cereal, and got cooking. Matt was in charge of the mashed potatoes (he knows how to make 'em good!) and the ham- a 10-pounder that he got at a local butcher shop- and I covered everything else. The ham turned out to be our first holiday "disaster", though technically it wasn't a true disaster, because it worked out okay in the end. The butcher said to wrap the ham in foil and bake at 350 for 4-6 hours. Since we were planning to do this for lunch, Matt put the ham in the oven at 6 AM. Well, by 11, when I had prepped over things to replace the ham in the oven, the meat was still cold and bloody in the center. So. Apparently, those directions were wrong. Annoyed and hungry, we consulted Google, then bumped the oven temp up to 450, unwrapped the ham and instead covered it loosely with foil, and baked it for another two hours, deciding we'd just have ourselves a mid-afternoon lunch/dinner. In the meantime, we prepped everything else...and started putting up the Christmas tree. About five minutes after taking this photo, the lights on the middle and bottom sections of our hand-me-down pre-lit tree went out (lol). Since this was an older tree that my mother-in-law had given us, there were no spare bulbs to change out to fix this problem. SO. Even more annoyed, yet chuckling lightheartedly about it because it's the holidays, we had to leave the problematic ham in the oven, hop in the car, drive to the closest Dollar General, and get $6 worth of more lights. The good news is, by the time we got back home, tested the new lights, and strung them, the ham was done. Our rumbling bellies outweighed the urge to decorate. We abandoned the tree and returned to the kitchen. The dressing was next in the oven. Then the best homemade macaroni and cheese ever. And then...my pride and joy. Completely. Homemade. Yeast. Rolls. While the rolls were rising, then baking, I worked on the stovetop dishes. Green beans- Southern style and wonderfully flavored with bits of ham. Oops. So gerd. And I, after placing a quick phone call to my mom for directions, made some heart-attack gravy with the ham drippings. When the rolls came out of the oven (to the sounds of Handel's Hallelujah Chorus), we pulled the deviled eggs and cranberry sauce (some surprisingly amazing, naturally sweetened, organic whole berry canned stuff from a health store in Columbia) from the fridge and stepped back to admire our work. It was really, really, really good. Plus, we didn't have to cook or buy any more food for an entire week. Seriously. The leftovers kept us from going to the store until December, which kept us from going a penny over our budget. That was pretty awesome. And delicious. And fattening. But we'll deal with that later. It's the holidays, man. After we finished eating and took a Once Upon a Time couch break, we turned Classic Christmas on Pandora and got back to the Christmas tree. We had so much fun putting up the tree together. I always said that when I had my own family, I would force my brood into a tradition of decorating the tree together. The last few years at the Bain house, if a tree went up at all, it was just my sister and me. Or just me. I was so thankful Matt jumped in, grabbed the ribbon, and cranked up the Kenny G. with me. We were both quite pleased with how it turned out, especially since we spent less than $15 on the whole thing! Thankfully, we'd both amassed our own separate ornament collections over the years (which complemented each other remarkably well), so it wasn't as empty as I expected it to be. And it fit into this corner so nicely and warmed up the room. The place just seems so cozy. Sadly, the tree was all we could manage in our nearing-comatose, post-dinner state. I put out the rest of the decorations a few days later on an afternoon after work (and I'll be posting pictures of that soon!). But I went to bed that night feeling very full of food and gratitude. After spending the day celebrating with my love (my husband- still can't believe it!) and our sweet pup in our nice little home, it was easy to see the silver lining, to be re-energized and filled with thankfulness.